“Ocean’s 8” earned $4 million at the Thursday box office, on its way to a mid-$30s opening weekend. In comparison, the all-female remake of “Ghostbusters” earned $3.4 million in previews before grossing $46 million its opening weekend. “Ocean’s 8” follows Danny Ocean’s estranged sister, Debbie (Sandra Bullock) as she organizes an elaborate heist to steal a priceless $150 million necklace from the Met Gala. 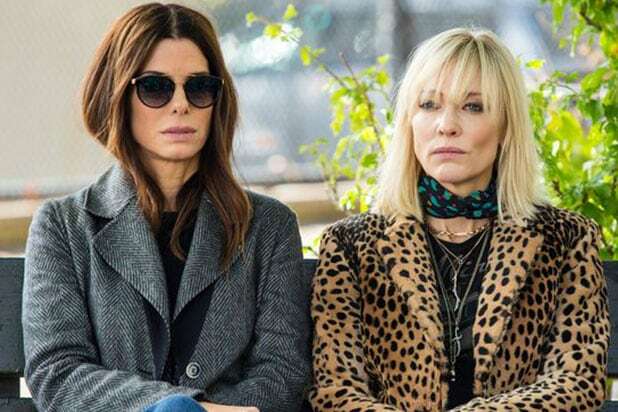 The film’s ensemble cast includes Cate Blanchett, Anne Hathaway, Mindy Kaling, Sarah Paulson, Awkwafina, Rihanna, Helena Bonham Carter, James Corden and Dakota Fanning. Gary Ross directed from a script he co-wrote with Olivia Milch, with Soderbergh producing with Susan Ekins. The film currently has a 71 percent score on Rotten Tomatoes. Also Read: Can 'Ocean's 8' Steal a Huge Box Office Haul Like 'Ocean's Eleven' Did? The production budget for “Ocean’s 8” was a reported $70 million. By comparison, “Ocean’s Eleven” was made on an $85 million budget and opened domestically to $38.1 million. While that figure is not an apples-to-apples comparison because “Eleven” was released in 2001, consider that the George Clooney-fronted heist classic went on to have incredible legs with a $183 million domestic total and $450 million made worldwide. “Ocean’s 12” grossed $39.2 million in 2004, while “13” earned $35.1 million in 2007. Also coming out in wide release but with smaller screen counts are A24’s terrifying horror film “Hereditary,” which grossed $1.3 million in previews from 2,964 theaters, and Global Road’s stylish action thriller “Hotel Artemis.” Both films are projected to open to $6-8 million this weekend. Written and directed by Ari Aster, “Hereditary” was made for less than $10 million. The horror tale stars Toni Collette as Annie Graham, a woman whose family discovers a horrifying secret about their heritage after the family matriarch passes away. The film, also starring Alex Wolff, has received critical acclaim since its premiere at Sundance, earning a 94 percent RT score. “Hotel Artemis” grossed $271,000 from 1800 locations on Thursday. The film stars Jodie Foster as The Nurse, a mysterious woman who runs a members-only hospital for criminals in a dystopian, near-future Los Angeles. Written and directed by Drew Pearce, the thriller also stars Sterling K. Brown, Sofia Boutella, Jeff Goldblum, Brian Tyree Henry, Jenny Slate, Zachary Quinto, Charlie Day, and Dave Bautista. It currently has a 57 percent RT score. In limited release, Focus Features will put out “Won’t You Be My Neighbor?” Directed by Morgan Neville, who won an Oscar for his documentary “20 Feet From Stardom,” the film looks at the life and career of Fred Rogers, the famed creator of the children’s PBS series “Mister Rogers’ Neighborhood.” Releasing in Los Angeles and New York this weekend, the film has been wildly praised since its Sundance premiere, earning a 99 percent score on Rotten Tomatoes. "Ocean's 8" takes place during fashion's biggest night, the Met Gala, so of course, there are a ton of A-list cameos to ogle at. Spoiler alert: Do not read on if you don't want to know who appears in "Ocean's 8." The model was a guest at the Met Gala in the film. Richie also made an appearance on the red carpet of the Met Gala in "Ocean's 8." Of course, Vogue's editor-in-chief is featured in the movie that takes place at the biggest, most exclusive fashion event of the year. Reuben Tishkoff (Elliott Gould), from the original "Ocean's" films, makes a brief cameo in the movie. The Amazing Yen (played by Qin Shaobo) from the original "Ocean's" movies also makes an important cameo. Once again, he is brought in for his flexibility. In one scene, Banksy makes an appearance. Well, sort of -- he defaces a painting in the art gallery and leaves his signature on it. Serena Williams also appears on the red carpet of the Met Gala in the film. The fashion designer sits at the chairman's dinner near Anne Hathaway's character in "Ocean's 8." The "Baywatch" actress is swarmed by photographers on the red carpet of the Met Gala. Common also appears at the Met Gala in the film. Heidi Klum has a little more face time in the movie, having a hilarious conversation with Sandra Bullock in German. Anne Hathaway's character sits next to Katie Holmes at the Met Gala. Olivia Munn also appears on the red carpet in "Ocean's 8." The designer was sitting at the table with Anne Hathaway's character at the Met Gala. The journalist was sitting at the table with Anne Hathaway's character at the Met Gala. The creative director of Estée Lauder was sitting at the table with Anne Hathaway's character at the Met Gala. Ok, we're cheating a little bit here -- Emma Stone's Vogue cover appeared for a split second in the movie. Everyone wondered whether Clooney would make an appearance in the film, and he did -- but just in a picture frame. Dakota Fanning plays a famous person who meets with Helena Bonham Carter's character in the film. Marlo Thomas, Dana Ivey, Mary Louise Wilson and Elizabeth Ashley played the four women who helped distribute the broken-up pieces of the Toussaint after the heist.